Like most years it started off with my early day mantra of “I’m so not going to overeat this year”. Fast forward to 6pm. I am breathing heavily with a case of the ham sweats. Fast forward even further to 10pm. I am sitting at home eating my second piece of leftover cake. It got real. The big sweatpants came out. The next morning I had gluten-free stuffing and eggs. Later that evening my husband threw me a birthday party where I decided it would be wise to stuff my face with tortilla chips and spinach dip and then drink like I was peg-legged sailor. Super real. Did I mention there was a dark chocolate and peanut butter cup gluten-free masterpiece of a cake AND creme brulee? I totally ate both. Let’s all recover from that pie hangover together. 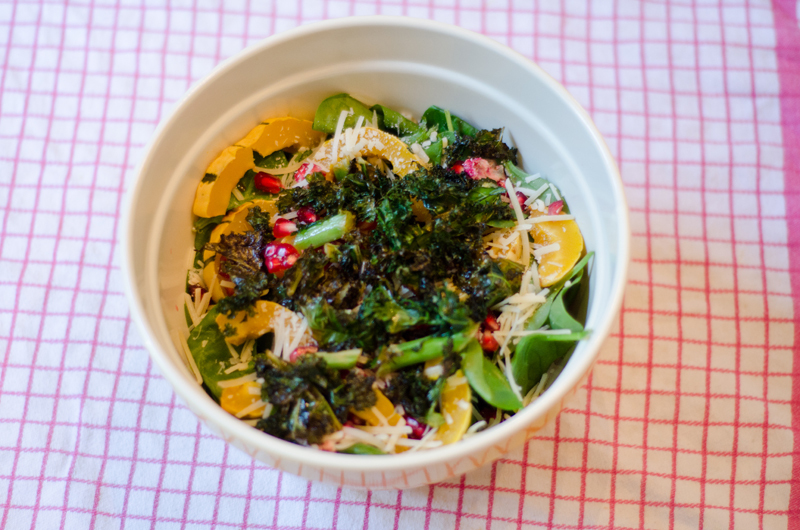 I’ve made you a spinach salad with delicata squash, pomegranate seeds, a little bit of cheese and some crispy kale. It could serve four… but in my house it serves two. Wash and dry your kale. Cut out the spines and then cut into small pieces. Place it into a mixing bowl with the juice of half of a lemon and a couple tablespoons of olive oil. Toss well and place on a baking sheet. Once the oven has heated, put in your pan and bake for 20 minutes of until your kale is crispy. Set aside. If you have a double or stacked oven you can roast your delicata squash at the same time. Preheat your second oven to 400 degrees. Wash your squash. Cut it open lengthwise and seed it. Rub some olive oil over the surface and place face down on a baking sheet. Bake it for 25-30 minutes or until it is soft and easily pierced by a fork. Wash your spinach and place it in a mixing bowl. Seed your pomegranate and layer the seeds on top of the spinach. Cut up your squash and add it to the bowl. 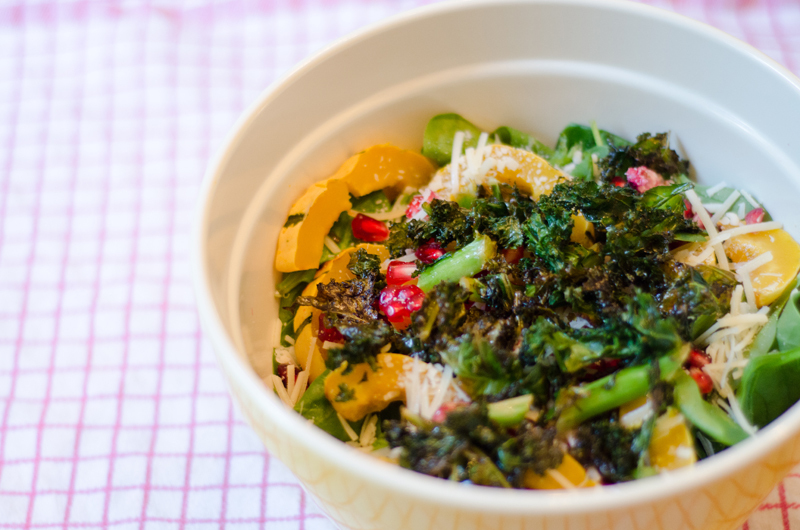 Add your cheese and your crispy lemon kale chips to the top. 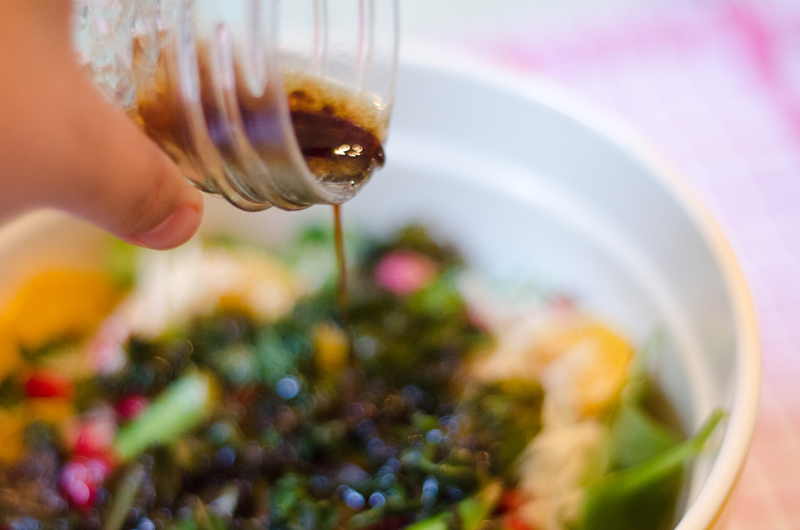 Wisk together all of your dressing ingredients. Add salt and pepper to taste. Let the pie recovery begin.